Embryo asymmetry is defined at the primitive streak stage by positive and negative signals. During gastrulation, cells migrate through the primitive streak to form the definitive endoderm and then the mesoderm. Cells that do not migrate form the intraembryonic ectoderm. The primitive streak elongates until the fourth week of development, after which the primitive streak regresses and disappears in the sacrococcygeal region. In human embryos, the primitive streak cells begin to form on day 15. 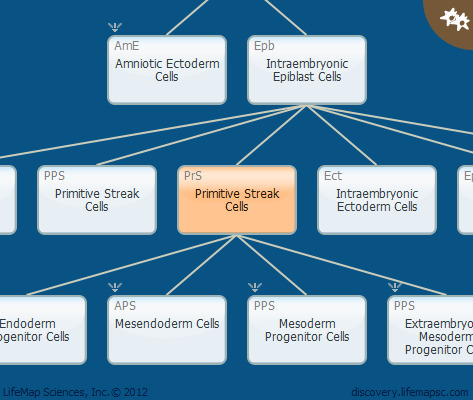 This cell card includes general information about primitive streak cells. For specific anterior-posterior primitive streak cell information, separate cells are displayed lower in the developmental tree. Activation of Nodal induces several transcription factors including Pitx2. Lefty and Cer1 inhibit Nodal activity in the left side of the primitive streak.